UJA1061 -- fault tolerant CAN. PHILIPS Electronics has unveiled the first two products of its System Basis Chip (SBC) family, expanding its portfolio of in-vehicle networking (IVN) products. 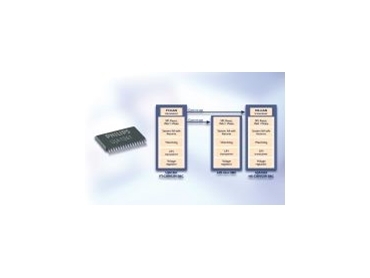 The UJA1061 combines fault-tolerant Control Area Network (CAN) with Local Interconnect Network (LIN), and the UJA1065 combines high-speed CAN with LIN. Philips' SBCs combine transceiver functionality, voltage regulators and a watchdog, with diagnostics and a fully embedded fail-safe system. The one-chip integration of generic electronic control unit (ECU) functions, with the fail-safe system, makes it easy for design engineers to build automotive network nodes that offer protection against network lock-ups and dead batteries. The Philips SBC family covers all CAN and LIN network applications, ranging from local electric window nodes to central engine management and dashboard applications.